Back on the Juicing Wagon! I juiced almost all of this, the only thing different is I only used half that beet at the northwest corner of the shot, as you really have to be careful when starting out with beets. Some folks get sick to their stomachs from too much, and although Paul and I have juiced them before, best not to risk it and only use half. 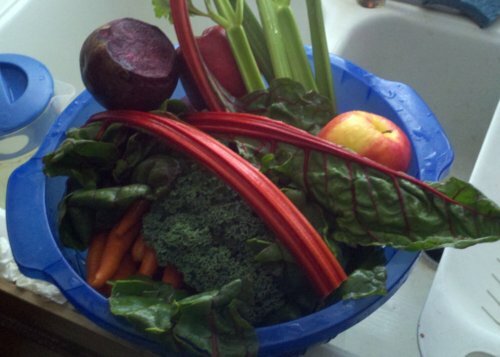 The end result was about 40+ ounces of delicious/nutritious juice (I drank some before photographing, sorry! ), plus all this pulp. The carrot pulp will become carrot-banana-coconut muffins later, and I'm undecided about what to do with the green pulp, maybe soup? 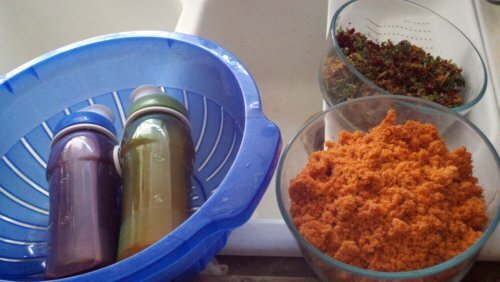 I juiced the carrots first so I could separate the pulp for the aforementioned muffins. :) Off to sip some juice and have some tofu onion pepper curry I made last night.